On July 28th, Frank and I ran in the Warrior Dash in Mt. Morris, MI together. It was a ton of fun! Last year I ran it with a group of people I met through my girlfriend, Marion, and it was a ton of fun for a different reason. Last year, we were goofing around on the obstacles, taking photos, and not doing a whole lot of running. Frank and I took a different approach to it. 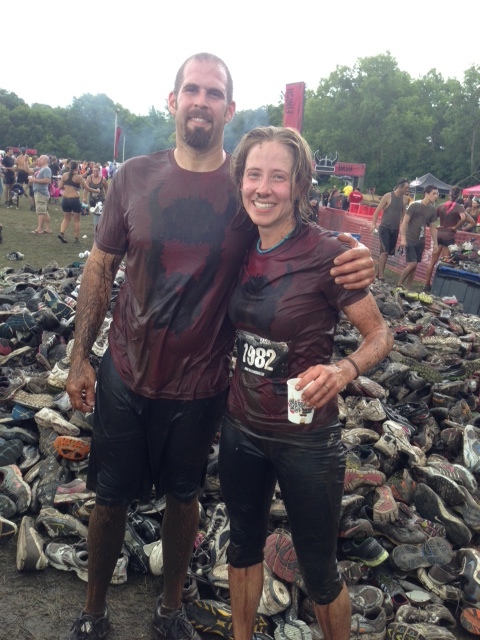 We RAN as hard as our bodies would permit, and we blasted through the obstacles like we were being chased. I enjoyed it so much. We completed the 5K with 13 obstacles in 39 minutes! It was a the most action packed dreary Sunday I’ve had in quite some time. During the past 2 years, Frank and I have fallen into a pretty predictable pattern when it comes to our workouts. As long as I mix it up and give us some sort of weekly or monthly schedule, Frank follows the plan without complaint. As long as we have some P90X2 and Body Beast workouts in there, he is happy. I’ve gotten used to leading the show and pushing us along – we encourage each other to set new goals so we continue improving our strength, balance, and flexibility. It works very well. However, if you would have seen us when we were working our way through the obstacle course, you would never guess that I’m the daily drill sergeant. This man was all over me. We’d be coming off an obstacle – and there he was jogging in place: “come on Kim pick it up,” “you can move faster than that!” It was exactly what I needed to hear – all sorts of firm yet encouraging words. I thoroughly enjoyed it. He was an animal, and I was just trying to keep up. This resulted in a course completion time I am pretty darned proud of. During the Dash we were coming off an obstacle that was a tube net suspended in the air by metal rings, and a man in a orange shirt and his wife shot in front of Frank and I. The back of his shirt said “Team Beachbody.” I issued a “Hoo-ah, Team Beachbody!” The guy (Joe) laughs and punches the air and as we run through a wooded trail we got to talking about our favorite programs. He had just been to Summit – and asked if I had been. I had told Frank a few weeks before that my goal is to make it there next year, and I repeated this goal to Joe, and asked him if he enjoyed it. It felt good to share my goal, because I know the more you talk about your goals, the more likely you are to hold yourself accountable in meeting (and exceeding!) them. I love meeting Team Beachbody team members – that simple interaction made me want to wear my miscellaneous Beachbody gear more places, as you never know if it will be a conversation starter. My girlfriend, Cat, ran in a Tough Mudder this year – and I think Frank and I may set our sights on running one of those next summer. Always good to have something fun to train for : ) Cat sounds like she would do it again in a heartbeat, so I’m ready to tell her she’ll have two more members for her team! This entry was posted in Body Beast, Checking In, Motivation and tagged Body Beast, functional fitness, obstacle course, P90X2, Team Beachbody, Warrior Dash. Bookmark the permalink.